In the summer I met my friend Jaclyn for a tapas. We sat outside and enjoyed the sunshine. And a Tio Pepe. 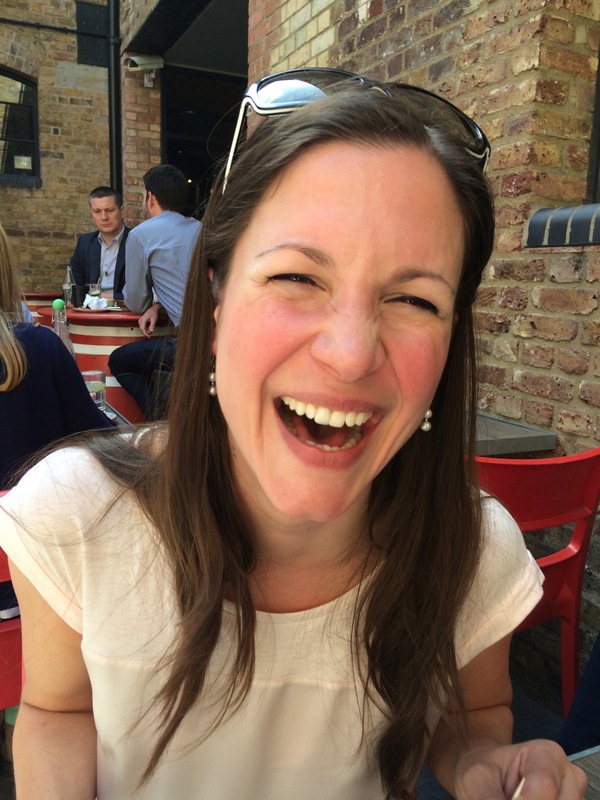 I’ve known her for a few years – she used to date a dear family friend – and we occasionally meet up to talk about work, children and – more recently – blogging. Jaclyn is very committed to wearing 100 per cent natural skin care products. 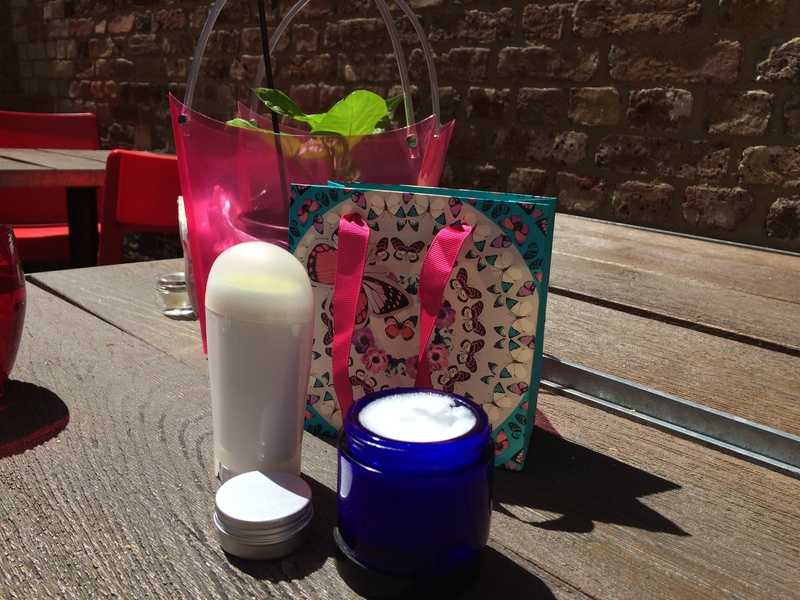 She very kindly brought along some skin moisturiser, lip balm and home made deodorant. And a chili plant, grown from a seed. How nice is that? Coconut oil (in the blue pot) is used as body moisturiser, or facial moisturiser, on a daily basis, or to remove make up. It is certified organic, unrefined and raw. Jaclyn suggests you can add five or so drops of lavender oil as it’s soothing, antiseptic and anti-ageing. It smells very nice and I have used it on my dry legs. Shea butter can be used on the lips and for dry hands before bed. It’s a bit thick to use on the hands during the day, but it works well on dry elbows. Jaclyn suggests that it aids healing and will help reduce scars. For dry or tired skin she suggests putting this on the face before bed. So far just my lips are benefiting. The deodorant is made from shea butter, coconut oil, bees wax, baking soda, lavender and tea tree oil. Apply lightly as it is fairly soft. Actually this is the stand out product for me. I found it easy to apply and completely effective. However two of my children tried it and found it was not strong enough for them. However I loved it. I agreed to try the products and give her some feedback. I have really enjoyed using the natural deo – I like the smell of the lavender which is fresh and astringent. Jaclyn has since dropped around a whipped body butter with lemon oil that I have been using to keep my feet soft. In the summer Jaclyn had a plan to use blogging to show people how to make these great products, using videos. She experimented with the format, but found it was very time consuming and rather expensive to make lots of videos. Jaclyn shared the video in which she makes “whipped body butter” and she really is a natural in both senses of the word. More recently, now she is back at work, she has come to realise that looking after her young family and holding down a responsible job means regular video-blogging (“Vlog-ging” as Saga Noren would say) would be too demanding. I was expecting to announce her website and it’s exciting content. For now this project is on the back burner. I decided to post the story anyway as trying to make things, make a living and make a family can be overwhelming. Let’s resolve, this year, not to expect too much of ourselves. And to encourage and support those who lay down responsibilities and reduce their workload. And let’s say Hooray for all of us who fail to vacuum under the bed, who give book tokens at Christmas and sometimes bunk off work early. Cheers everyone. Happy New Year. I’m interested in the natural deodorant. Sounds great. I agree with you about expectations though of course for the first half of the year expectations of me are very high but then I don’t vacuum under the bed, anyway! The natural deo includes lavender oil (which I have found works quite well on its own) and some beeswax to make it stick! Wise words, always, from you Bunny. I love that text. In fact I recently paraphrased it for a bereaved friend who felt guilty that she was taking rather than giving. There is a time to receive isn’t there? Especially when we have our hands full as mothers. One of the great joys of grandparenthood is having the time to give to others and to have the luxury of time to please ourselves. How very wise to know your limits. It is a skill that sometimes eludes me. Her products look very nourishing – but still appealing. Thank you for posting this very thoughtful piece. Kudos to your friend on thinking about priorities and making a difficult decision accordingly – it’s not easy to do these days with so much noise about achievement and the constant reinforcement from many internet sources. Small children are absolutely demanding and time-consuming, in the best possible way, which is often forgotten in the blitz of stories about women who are “doing it all” . I too say Hooray for authenticity and thoughtful blogging and amen to not vacuuming under the bed. Life is short. I’m actually just editing the last of the vids (inc. deo) and I’ve decided to just release the videos into the youtube world, and not anchor them to a blog (time issue still) but at least they might be of benefit to someone out there…and I can pick up on it ‘in another season’ (beautiful and positive quote Bunny – I’m adopting it! ).